The Vietnam War has been present, if only tangentially, in the fiction of Denis Johnson all along. In Jesus’ Son (1993), a collection of stories and Johnson’s best-known work, one of the minor characters is a draft-dodging kid who appears by the side of the road, hitching his way to Canada. In Fiskadoro (1985), a post-apocalyptic novel set in the Florida Keys in the mid-twenty first century, the only character with distinct memories of the Time Before is a centenarian, now mute, named Grandma Wright, the daughter of an Englishman and his Vietnamese wife. The thing she recalls most vividly is her escape from Vietnam in the last days of the war, on a helicopter that crashed in the China Sea, killing nearly everyone but her. She goes over and over this memory in her mind, working it like a string of worry beads—perhaps the final link to life on earth in the twentieth century. In Resuscitation of a Hanged Man (1991), the pilot of that helicopter, Nguyen Minh, makes a brief appearance, and Lenny English, the novel’s protagonist, is haunted by “a tattooed ghost that was stalking him, the dead GI in Vietnam, the one who’d been drafted in Lenny’s place, sent overseas in Lenny’s place, marched over swamps and shot and killed instead of Lenny.” As far back as Angels (1983), Vietnam was present, if only implicitly. Angels charted the descent of two brothers, James and Bill Houston, on their way to prison and death row after a bank heist gone wrong. Now, in light of Johnson’s new novel, Tree of Smoke, which gives us the back story of both men, we can see Angels for what it is, at least in part: a horror story of men who’ve returned from war to a life of no purpose. Tree of Smoke is many things—Johnson’s magnum opus, a pastiche of Vietnam novels and movies and nonfiction accounts, a philosophical exploration of military intelligence, an atmospheric thriller in the mode of Graham Greene or John Le Carré—but perhaps most interestingly it is the prequel we didn’t know existed to Johnson’s entire body of work. No fewer than eight of its characters have appeared in Johnson’s other novels, and perhaps more: an interesting but futile guessing game results after a while. Is the missionary and aid worker Kathy Jones of Tree of Smoke the cynical, unnamed narrator of The Stars at Noon, Johnson’s moody novel of Nicaragua in the mid-1980s? And is the Englishman with whom that narrator becomes fatally entangled related, somehow, to Anders Pitchfork, the British ex-paratrooper who appears in Tree of Smoke? Even more interesting, perhaps: was Tree of Smoke the novel Johnson meant to give us in, say, 1980, but was bedeviled by for nearly three decades? If so, it was worth the wait. The cause was addiction to alcohol and, later, hard drugs, including heroin. This is the piece of Johnson’s biography that has become legend. Jesus’ Son, his collection of autobiographical stories revolving around the misadventures of a character known mostly as Fuckhead, mines the period of Johnson’s life during his run of addiction in the 1970s. When I took my one and only creative writing class at the University of Montana in the 1990s, not long after the book came out, it seemed to me and my fellow fiction aspirants to obliterate, once and for all, the influence of Carver on our feeble attempts at the short story. Here was a voice we could only take inspiration from, never exactly emulate. Here was a writer who’d gone to the dark side, deep into madness, and returned, somehow wiser and with his sense of humor intact. It appeared to us borderline holy that this man could write so directly, with such lack of braggadocio and self-pity, about a guy making an absolute ruin of his life. The same was sometimes said of Carver, but Johnson made Carver seem lugubrious. The circumstances of the book’s creation only added to Johnson’s countercultural aura. Owing the IRS back taxes, the story went, he revisited some sketches he’d written from his addict days, polished them up, and sold them to Farrar, Straus and Giroux. In lieu of an advance, FSG agreed to pay his tax bill. Four of the stories appeared in the New Yorker, and they read like no short fiction that magazine had ever published. There were many moments in the Vine like that . . . where you might think today was yesterday, and yesterday was tomorrow, and so on. Because we all believed we were tragic, and we drank. We had that helpless, destined feeling. We would die with handcuffs on. We would be put a stop to, and it wouldn’t be our fault. So we imagined. And yet we were always being found innocent for ridiculous reasons. Johnson gave us the voice of the trickster past his last trick. The language was shorn of needless artifice yet inflected with the absurd, as if Camus had become a dope fiend and later found God. By confessing his unreliability—“or maybe that wasn’t the time it snowed”—the narrator seemed only to enhance his credibility. When read straight through, the book’s incantatory prose offered the reader an almost physical sense of what addiction must be like. This is the quality on which Johnson’s reputation rests: his sentence-by-sentence ability to make the language strange, beautiful, even poetic, to conjure extreme states of mind in prose that is never hysterical. Tree of Smoke is dedicated, as was Angels, to “H.P.,” which we can reasonably assume means Higher Power, an acknowledgment of Johnson’s spirituality and the role it played in helping him beat addiction. This recurring dedication also provides a clue to the overarching theme of his novels. All of them, to some extent, chart the path of doomed seekers, unholy prophets, squalid sinners. 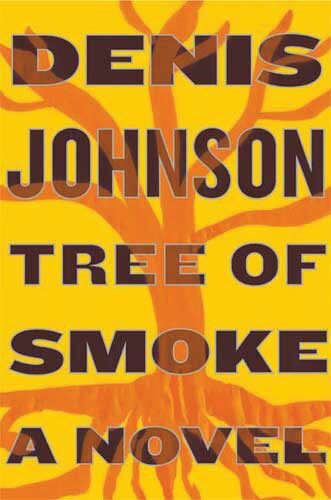 Tree of Smoke is different only in that it treats Buddhism, anti-communism, and military intelligence with the same religious intensity Johnson has shown in his preoccupation with the Christian notions of sin, sacrifice, and betrayal—as well as certainty and doubt. … as he walked beside the road he felt his anger burning up in the heat of noon, and he saw himself, as he often did when he was outdoors on hot days, being forged in enormous fires for some purpose beyond his imagining. He was only walking down a street toward a barroom, and yet in his own mind he took part in the eternity of this place. It seemed to him—it was not the first time—that he belonged in Hell, and would always find himself joyful in its midst. Again and again in Johnson’s novels we find characters rushing toward their doom with something like relish, as if damnation were a reward and not a punishment. How does someone like James Houston reach that point? Angels left the answer to that question mysterious, but Tree of Smoke provides one in exquisite detail: He goes to war. War is ninety percent myth anyway, isn’t it? In order to prosecute our own wars we raise them to the level of human sacrifice, don’t we, and we constantly invoke our God. It’s got to be about something bigger than dying, or we’d all turn deserter. I think we need to be much more conscious of that. I think we need to be invoking the other fellow’s gods too. And his devils, his aswang. He’s more scared of his gods and his devils and his aswang than he’ll ever be about us. So we have an infantryman: James Houston, who goes to war to become a man and does, though not the kind of man he had perhaps hoped. We have a nurse attached to various nonprofit charity organizations: Kathy Jones, a compassionate, even passionate woman susceptible to Calvinist despair. We also have a CIA agent, Skip Sands, and his uncle, the Colonel, also of the CIA. The Colonel, it slowly emerges, has become a rogue within the agency, co-opting a platoon of infantry to control a stretch of country where he can play out his theories of psychological operations, without agency oversight. Yet, interestingly, we also have Vietnamese characters who are far from stock caricatures, and they give the book a great deal of its soul and power. Trung Than is a North Vietnamese agent who’s slowly lost his faith in the communist cause. His childhood friend, Nguyen Hao, is his contact on the other side as he contemplates becoming a double agent. Hao’s nephew, Nguyen Minh—the helicopter pilot who first appeared in Resuscitation of a Hanged Man—serves as the Colonel’s personal chauffeur. All of them gamble their fates in the hope the Americans are their ticket to a better life after the war. All of them doubt their decisions, and only blind luck saves them. At the sight of the flag he tasted tears in his throat. In the Stars and Stripes all the passions of his life coalesced to produce the ache with which he loved the United States of America—with which he loved the dirty, plain, honest faces of GIs in the photographs of World War Two, with which he loved the sheets of rain rippling across the green playing field toward the end of the school year, with which he cherished the sense memories of the summers of his childhood, the many Kansas summers, running the bases, falling harmlessly onto the grass, his head beating with heat, the stunned streets of breezeless afternoons, the thick, palpable shade of colossal elms, the muttering of radios beyond the windowsills, the whirring of redwing blackbirds, the sadness of grownups at their incomprehensible pursuits, the voices carrying over the yards in the dusks that fell later and later, the trains moving through town into the sky. His love for his country, his homeland, was a love for the United States of America in the summertime. That replica of the human ear over which Skip broods, with its complex and coiled canals, serves as a guiding metaphor of the novel. Skip enters the labyrinth of doubt the moment he cracks open, in the French villa, the works of Artaud, Bataille, Cioran. All of a sudden, nothing is quite so simple anymore. One of the Colonel’s psy ops programs involves mapping underground tunnels used by the Viet Cong, an effort to turn those tunnels against the enemy’s psyche, and into a tool of mental torture. He calls it Project Labyrinth. It remains secret even from his CIA superiors, at least for a while. But once it’s finally uncovered, and the agency begins peering into the Colonel’s other freelance projects—including his surreptitious courting of the double Trung Than—the loyalty of everyone associated with him comes into question. If the novel is cautionary in any respect, it’s not in regard to imperial ambition, government hubris, blind patriotism or all the other ways in which Vietnam War stories have served as cautionary tales. Most of the great cinematic and literary art to emerge from the war seems devised as morality plays, an effort to try to ensure that such a thing never happens again, and Johnson only feints in their direction, halfheartedly. Instead, he offers us a look at all the reasons why it will only continue to happen, again and again and again. The novel is cautionary because it refuses to referee between the perils of doubt and certainty in the individual human mind. Both, Johnson seems to be saying, are dangerous; either may bring us to ruin. Doubt in his own instincts, as opposed to the rules and procedures of his trade, entice a German assassin to the wrong end of a gun. Doubt destroys the Colonel: his inability to trust his superiors leads him to become a pariah, hounded by colleagues bent on discrediting him. Doubt also plagues his nephew Skip, who came to Southeast Asia absolutely certain of the supremacy of democracy, capitalism, the American system of government and way of life; one by one he is stripped of his illusions until he is left naked, imprisoned, and alone. Yet, conversely, doubt is perhaps the only thing that keeps Kathy Jones from madness—doubt that all is foreordained, and there is nothing within the power of the individual to alleviate others’ suffering. Certainty that the Colonel still lives, even after reports of his death, drive one of his lieutenants mad: Jimmy Storm, whom we will meet again in Resuscitation of a Hanged Man, where he turns up criminally insane. If Vietnam was there almost covertly in Johnson’s fiction all along, madness has been the more visible common denominator. The hallucinatory madness of addiction (Jesus’ Son). The madness of suicidal ideation (Resuscitation of a Hanged Man). The madness of family (Angels). The madness of grief for family (The Name of the World). The voodoo madness that results from a loss of cultural memory (Fiskadoro). The madness of attempting to find enduring meaning in a land at war (The Stars at Noon, Tree of Smoke). Madness, Johnson is not the first to suggest, results from contradictions we cannot keep straight within our own minds. It results from a lack of Keatsian negative capability. That we could be guilty yet found innocent; that we could be innocent and found guilty; that we could do harm in the service of ostensibly noble ideals: these notions, as played out in in his fiction, make Johnson a novelist for our time, and make Tree of Smoke more than a period piece. It turns out to be the novel we needed right now. All around us we see an erosion of meaning arising from willful denial and mindless certainty. Certain phrases have taken on a stock appeal for late-night comedians: “Mission Accomplished” being only the most heavily leaned on. These erosions of meaning are symptomatic of a certain cultural madness, of a mind that refuses to accept doubt or, conversely, is paralyzed by it. Or, even worse yet, paralyzed in the face of what is obviously mistaken certainty. Doubt and certainty are the flip sides to the same cursed coin. At the moment, they are what make our politics so dysfunctional. Certainty led us to disaster in Iraq, and doubt did not have the power to stop it. Johnson’s streak of Calvinism is, therefore, as much a warning as it is a method. By employing it, he warns of the consequences for those who view the world through the lens of good and evil, the saved and the damned, the loyal and the disloyal. Yet in doubt there is no salvation to be had either. This is one of many subtle ironies that give the novel a hum of tension. The Colonel prizes, above all else, personal loyalty: he tells, again and again, the story of how his friend Anders Pitchfork, the British ex-paratrooper, gave him a hard-boiled egg when he sat on the brink of starvation in a Japanese prison camp. Yet it is precisely that personal loyalty that feeds the Colonel’s growing contempt of loyalty to the agency that employs him. His certainty about his own motives and methods leads him to doubt the methods of the bureaucracy. Certainty feeds doubt, and doubt certainty, in a kind of labyrinth of a feedback loop the Colonel—and everyone who ever believed in him—cannot, ultimately, escape. It seems to me only human to hope that we have better luck, while acknowledging the odds against it. Philip Connors is the editor of New West Reader (Nation Books, 2005), an anthology of essays on the modern American West. His work has appeared in n+1, Georgia Review, The Nation, Salon, and the London Review of Books. He lives in New Mexico.